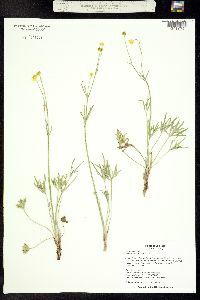 Stems erect, never rooting nodally, hispid or glabrous, base not bulbous. 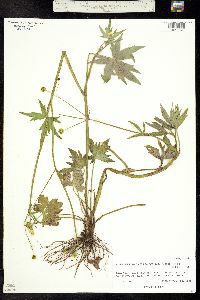 Roots never tuberous. 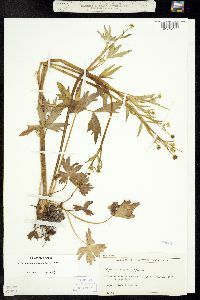 Basal leaf blades cordate to reniform in outline, 3-parted or sometimes 3-foliolate, 1.8-5.6 × 2.8-8.3 cm, segments again lobed, ultimate segments elliptic to lanceolate, margins toothed or crenate-toothed, apex acute to rounded-obtuse. 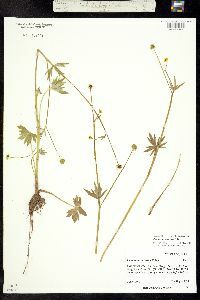 Flowers: receptacle glabrous; sepals reflexed or sometimes spreading, 2-3.5 × 1-2 mm, pubescent; petals 5, yellow, 2-4(-6) × 1-2(-3) mm. 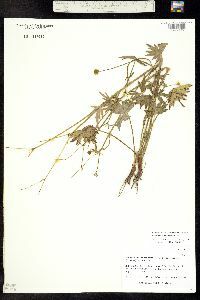 Heads of achenes globose or hemispheric, 4-7 × 4-7 mm; achenes 2-2.8 × 1.6-2 mm, glabrous or sparsely hispid, margin forming narrow rib 0.1-0.2 mm wide; beak persistent, lanceolate, curved, hooked, 1.2-2.5 mm. 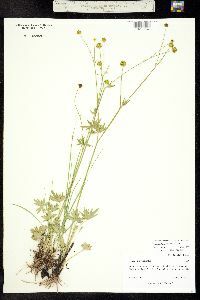 2 n = 28. 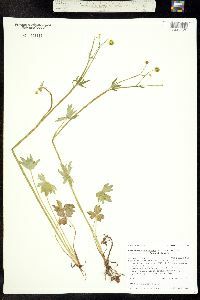 Flowering spring-summer (Apr-Aug). 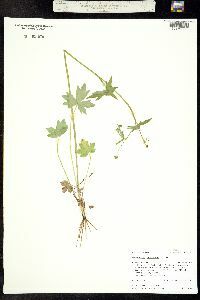 Moist meadows or woods, often along streams; 0-3400 m; Alta., B.C. 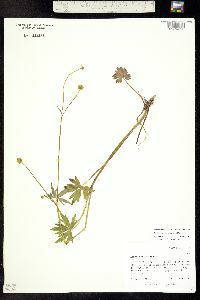 ; Alaska, Ariz., Calif., Colo., Idaho, Mont., Nev., N.Mex., Oreg., Wash., Wyo. 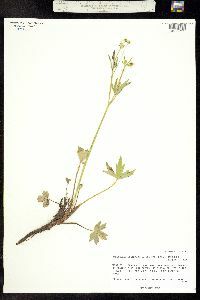 Plants with hispid stems and achenes are often separated as Ranunculus uncinatus var. 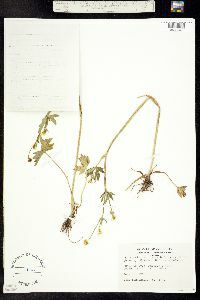 parviflorus ; these two characters are poorly correlated, however, and sometimes vary between plants in a single collection. 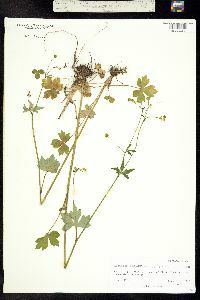 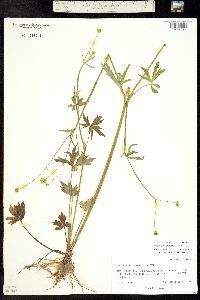 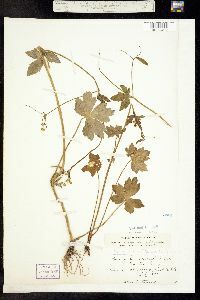 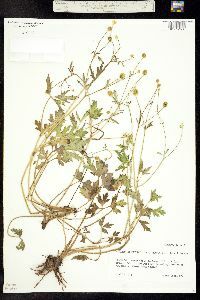 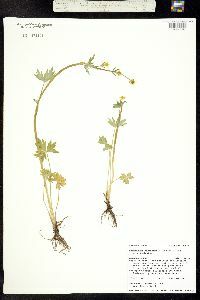 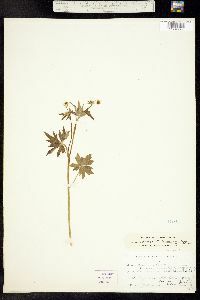 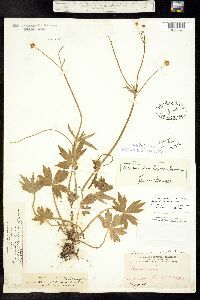 Ranunculus uncinatus was reported from northeastern Alberta and adjacent Northwest Territories by H. J. Scoggan (1978-1979, part 3). 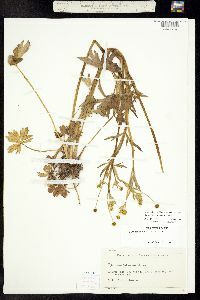 The specimens have hairy receptacles and straight, broad achene beaks; they apparently represent small individuals of R . macounii . 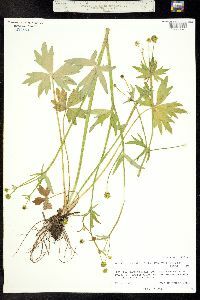 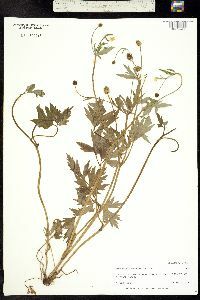 Some Native Americans used Ranunculus uncinatus as an antrirheumatic, a diaphoretic, a disinfectant, and an orthopedic aid, as well as in herbal steam baths intended to soothe sore muscles and rheumatism (D. E. Moerman 1986).